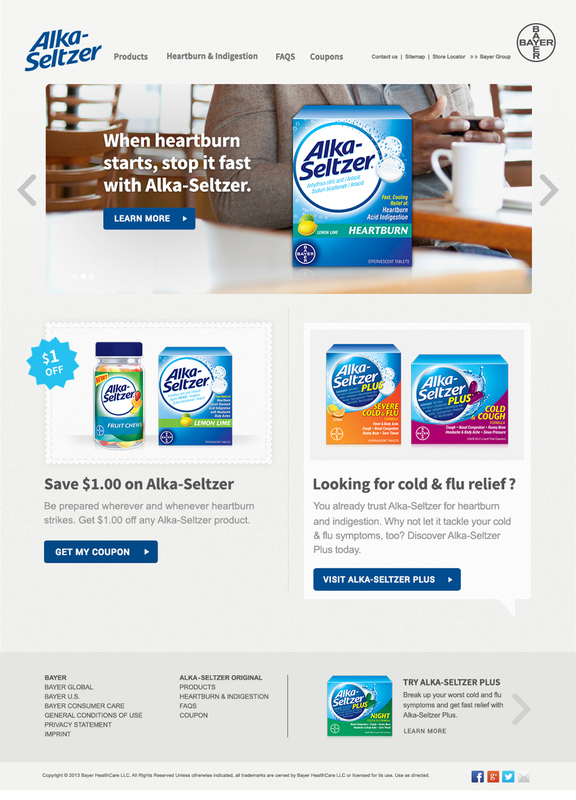 I was contracted by an agency to help build out the websites for Alka-Seltzer Plus (ASP) and Alka-Seltzer Original (ASO). A vast majority of the main style for the website had been created prior to my involvement. My task included: working within the established design guide to complete the design for the rest of the site, keeping in mind that it had to be responsive so that it could transition from desktop to mobile seamlessly. Along with finishing the design, I helped choose photography and prepare the site assets for development. I worked mainly with the Art Director on the project in the beginning and by the end, began to work more directly with the Creative Director over the project providing design and art direction assistance. Together, we completed both sites within our short time frame. The client was happy with the result. The ASP site is live and has undergone minor changes. The ASO site was never launched and I'm not sure what the launch plans are at this point.